In our dashboard we allow users to look at the official election turnout data provided by the Kansas Secretary of State, but only at the county level and only for the general election. Occasionally we receive requests for turnout data for the primary election or for other geographies like State House or Senate District. Why don’t we offer that as well? An example of county level general election turnout data. The Secretary of State does not release turnout numbers other than for the general election at the county level. When we asked the Kansas Secretary of State’s office why they did not publish other official turnout numbers, the staffer we spoke with said that their internal reporting pipelines only report on county levels by default. They are able to release other numbers, but they just never get that request very often. So in absence of official turnout numbers, is it possible to generate an estimate for turnout at other geographies/elections? Yes. It’s important to us that within any given tab of the dashboard to keep the data all coming from the same source so that the data can be easily comparable. 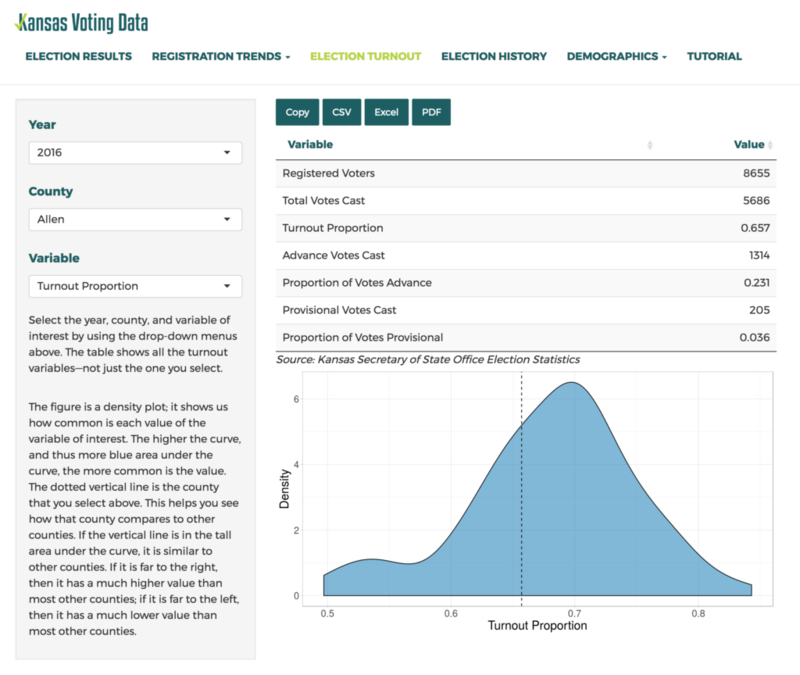 For example, The “Demographics” tab includes data from the Census Bureau’s American Community Survey; the “Registration Trends” tab is based on data from the state voter file. The Kansas Secretary of State Office provides turnout data at the county level alone. A few estimates for turnout at the congressional, state house, or state senate level are possible, but each have problems with systematic error. First, counting how many votes were cast in congressional, state house, and state senate races from the election results data is an underestimate: What if someone turned out to vote, but did not vote down-ticket for a state senator? This estimate does not include those people, introducing error. But error is fine if it is random—that is, it affects every possible type of person equally. However, we believe this error can be systematic, in that some types of people are more likely to be left out of this estimate than others. The type of person that is less likely to vote down-ticket than at the top of the ticket is systematically underestimated. For example, if a Republican was running uncontested in a state house district, Democrats might elect to just not vote in that election. This means that Democrats would be systematically underestimated using this method. Second, we could estimate this from the voter file by counting how many people voted on a given election date (for example, 2016 General) by congressional, state house, and state senate district. However, these estimates would introduce another error. We obtain voter files from the the Kansas Secretary of State approximately once per month. When we request a file shortly after an election it is common to find that some counties have updated “voter history” to reflect the election that just occured, but several counties will not have updated the file yet with that information. By the time that all counties have updated their records it is frequently weeks after the election has passed. What could happen in those few weeks? People might be dropped from the voter file (moved, deceased, etc), so we would be underestimating the count because these people’s data are no longer in the file. To the extent that people in different districts are more likely to move out of state (or otherwise get dropped from the voter file), we would be systematically underestimating some districts when compared to others. In short, we do not want to mix definitive data from the Secretary of State’s office with estimated data—we believe this could be misleading and lead to inaccurate conclusions when comparing districts. This highlights the importance of creating a more statewide standardized data collection process so that the people can have an accurate picture of civic health across the state. So what do you think? Is it important to you that more granular turnout data is made available? How would you use that data? Let us know in the comments below and perhaps we can compel the Kansas Secretary of State to publish this data in additional formats.